Feb. 27, 2013 — As we did two years ago, Remapping Debate has teamed up with the Center for Responsive Politics to examine revolving door and “reverse revolving door” issues. In our last edition, we looked at how many Chiefs of Staff and Legislative Directors that had worked for outgoing members of last session’s (112th) Congress have gone on to work for lobbying entities. For this week, we looked at the Chiefs-of-Staff and Legislative Directors for new members of this session’s (113th) Congress to determine how many were at some point in the past associated with a lobbying entity. Updated March 14, 2013, and now including: (a) Policy Directors, Policy Advisors and Communications Directors; (b) New staff members in the relevant positions for senators and representatives who had joined Congress prior to 2013. 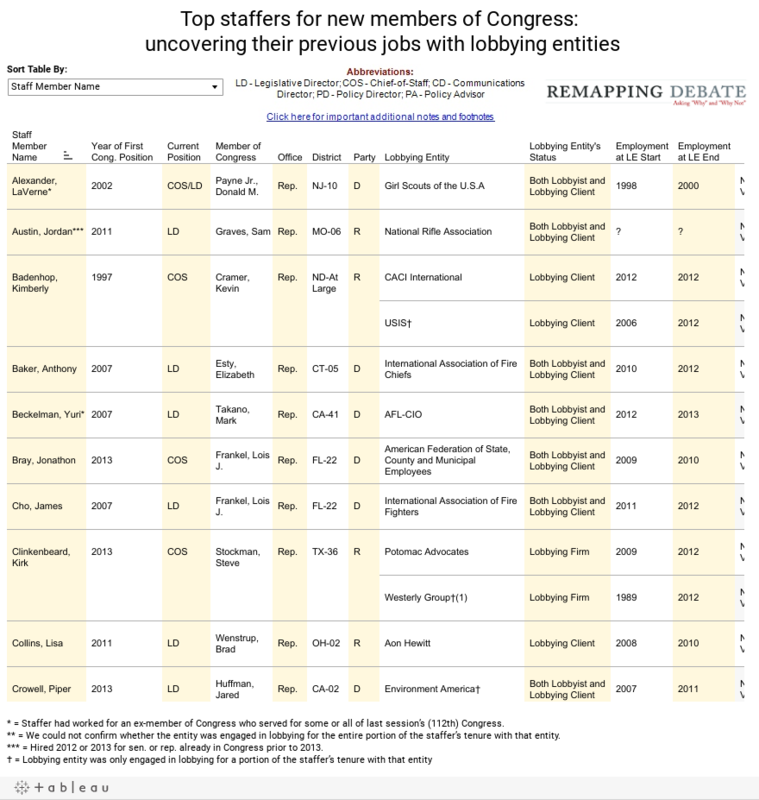 Remapping Debate found 55 staffers in new positions who had at some previous point been associated with organizations that engaged in lobbying or were lobbying clients. The table below is sorted by staff member and provides other sorting options via the dropdown box above the table. Please note the column “Year of First Cong. Position” indicates the first year for which Remapping Debate could confirm the individual was a member of a Congressional staff. Except otherwise indicated, the staffers listed started their current Congressional positions in 2013. Some entities listed as both lobbyists and lobbying clients may have only engaged in both activities for a portion of the staffer’s tenure. Some staffers may not have been employees of a lobbying entity, but consultants to a lobbying entity.